← The Kindness of Friends – And Strangers! It doesn’t matter which road you take into Lompoc, this lovely town to which we have moved; you will be greeted with a sign that announces that it is the “City of Arts and Flowers.” Before we arrived, we found out in our research that Lompoc supplies more than half the world’s flower seeds to retailers and many of the cut flowers that florists across the country. When we saw the glorious field of flowers below, we had to take a picture of it! 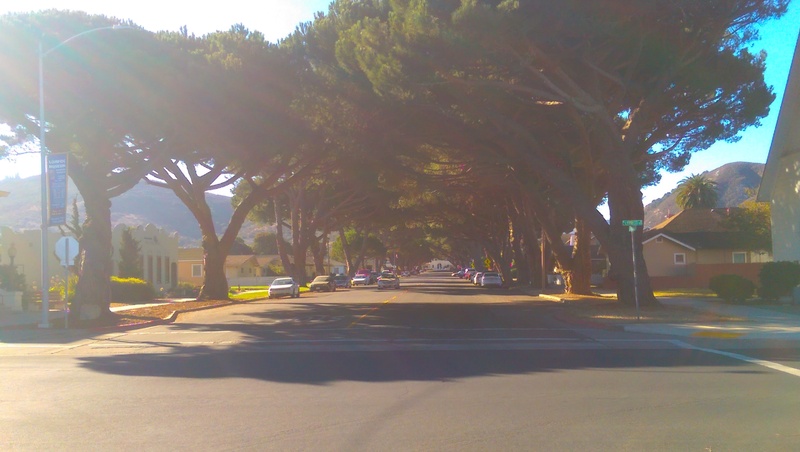 Although not really a flower, another nod to that part of Lompoc’s claim to fame is the bower of Italian Stone Pines that grace the main drag in Old Town Lompoc. These trees were originally planted by mistake in 1940 and are now valued at over 3 million dollars. It’s such a treat to drive through this canopy of greenery. The “City of Flowers” we understood, but it wasn’t until we looked around a bit did we get the “Arts” part. From what I’ve read, Lompoc was looking for a way to bring tourism to their small town and in 1990, the first mural was completed. Emblazoned on the sides of buildings, tucked away in alleys, in some of the most unexpected places are murals. 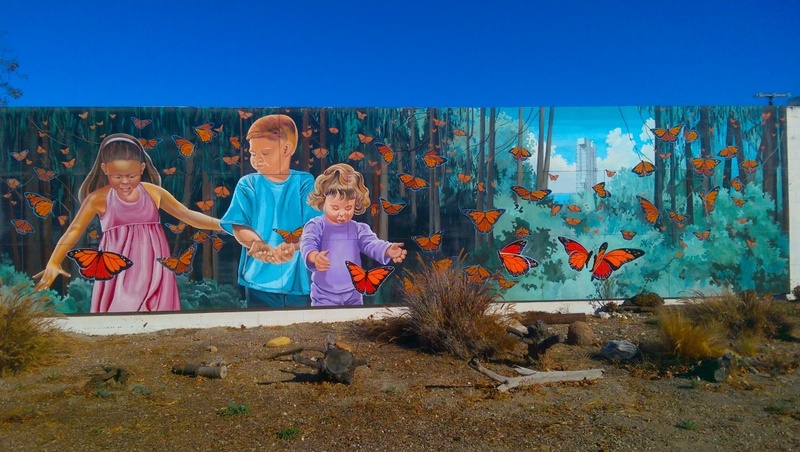 Lompoc officially has 40 murals in its inventory, but many privately created pieces are spread across town. This mural is called Flora and Fauna. It was part of the “Mural in a Day” project in 2001. It was painted by a group of artists in, that’s right – one day! Space is a recurring theme as that is an important part of Lompoc’s industry. 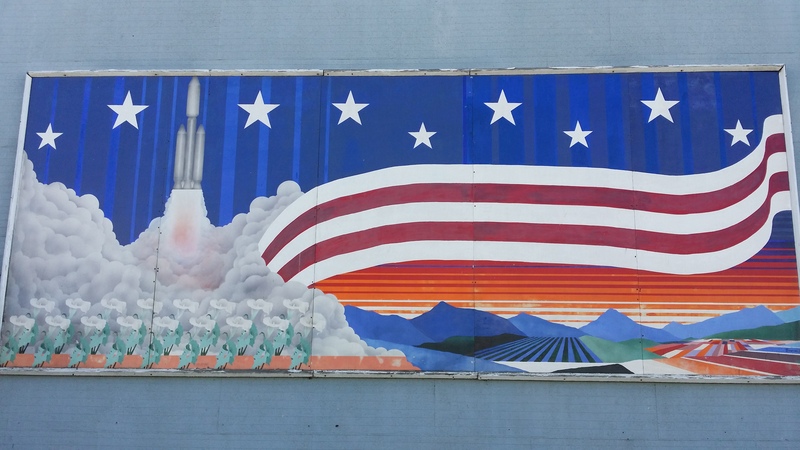 Vandenberg AFB, the reason that we are here, falls under space command and is one of the area’s largest employers. 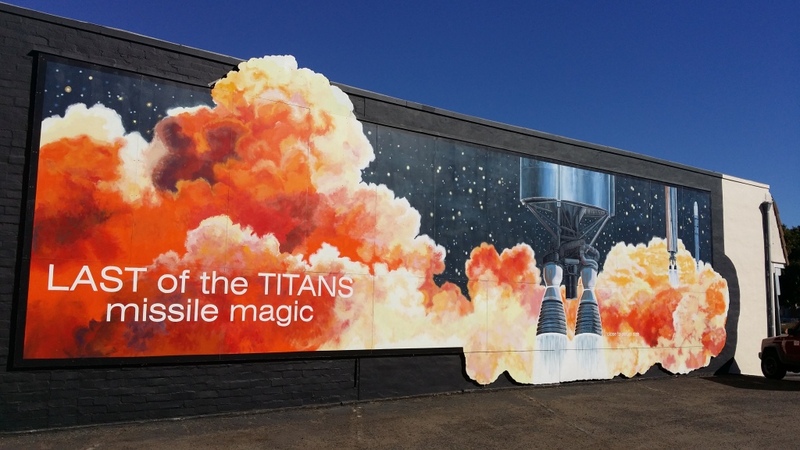 The locals are proud to be a part of America’s space program and it shows in the murals. Again, I don’t know if this one has a name, but it was in Art Alley. This particular mural was a bear to try to photograph since neither Alan nor I are really photographers, but I had to post it. This mural pays tribute to all the men and women who served, fought, and died in the 15 wars and conflicts of the 20th century. It’s huge and takes up the entire side of a building. It is awe-inspiring and made me so proud to be both an American and a new Lompoc resident. 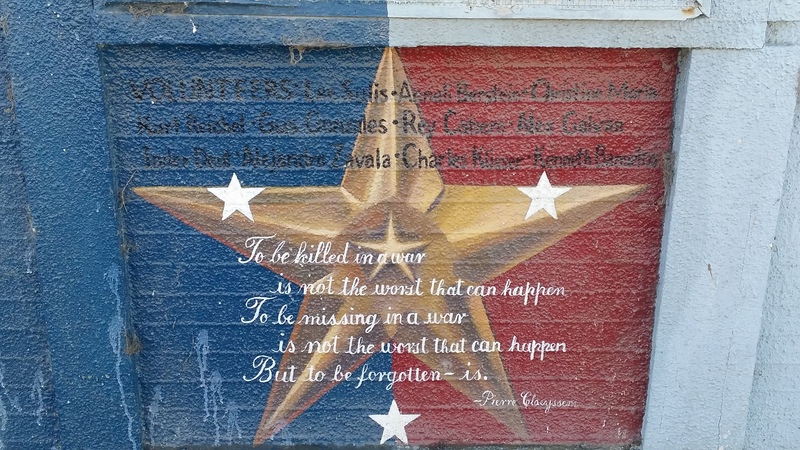 Next to it was a smaller mural that reminds us that we must not forget. Beautiful Sentiment – Let’s Not Forget Those Who Served! Here a couple more that I just had to share because they are so beautiful! 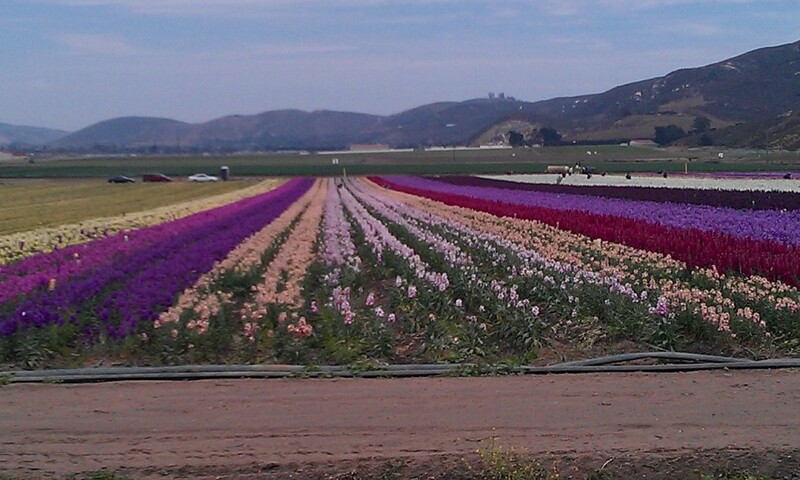 I couldn’t find a name for this one, but it appears to depict the flower fields of Lompoc. 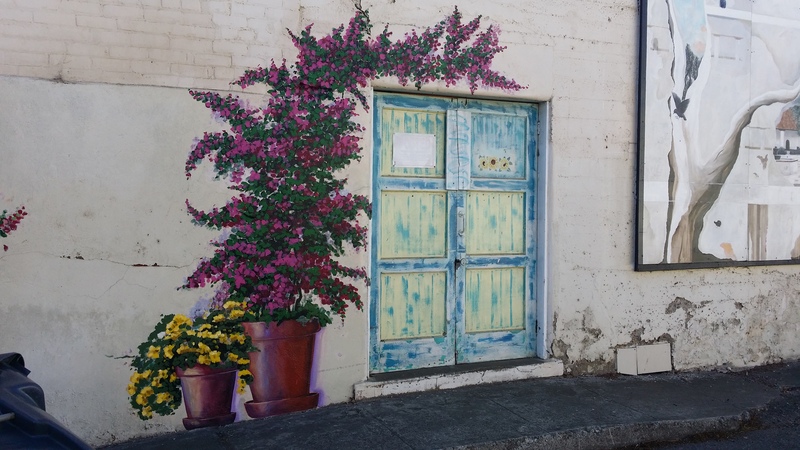 Even the doorways in Art Alley are decorated! I couldn’t even begin to post all of the amazing pictures that we found, but I thought I’d share a few. It was such fun, walking up and down alleys, driving to different sections of town, seeking out these small masterpieces that I think I’m going to make a regular practice of posting them as I find a group. Stay tuned to see more! They are AWESOME! 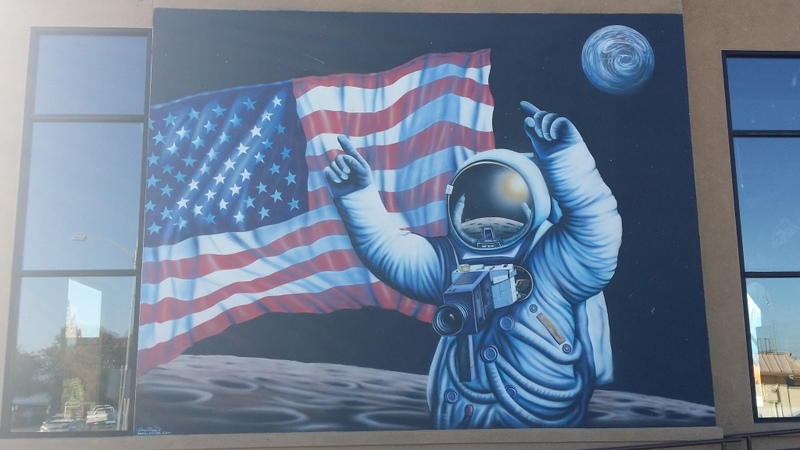 This entry was posted in Lompoc and tagged art, art alley, california central coast, murals, stone pines, titan missile, veterans. Bookmark the permalink. Jerre, glad I could offer a different perspective for you! We think it’s great here! California is a very beautiful state!! I have got to get back and get a West Coast fix!! Great blog Odie!! Charlie, know that you always have a place to stay if you come this way! Another good weekly blog. I look forward to them. 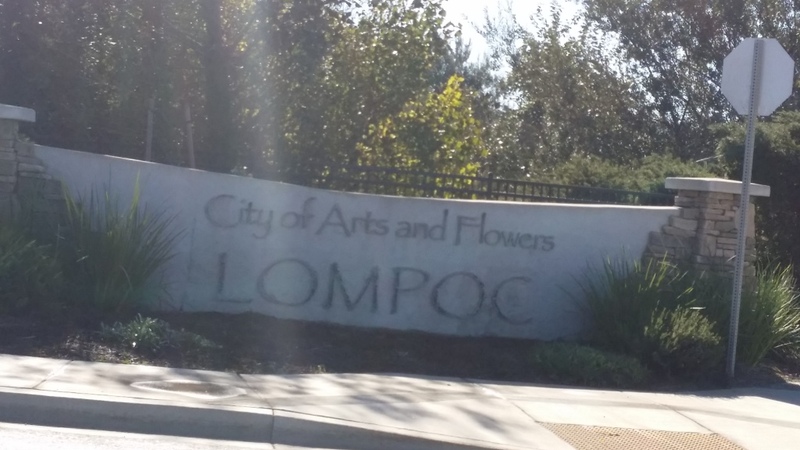 Never been to Lompoc. But I think we’ll get there in the next year or two. Go Texans! Thanks, Kim! Can’t wait for you guys to come visit! Nice pictures! 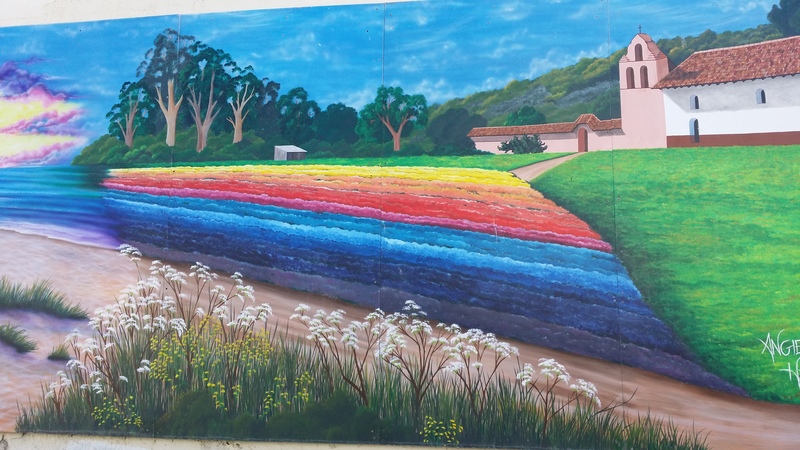 The vibrant flower field mural was painted by Angie Hamlin. I know her, she goes to my church! If you visit Grossman Gallery (corner of H Street and Cypress, across from Museum) you can buy some of her art. Thanks for sharing that info, Lina! I saw the gallery and fully intend to get in there! Thank you for reminding me why I fell in love with Lompoc 16 years ago. I had forgotten its beauty. Shawna, so glad you got something out of my little post! It truly is a lovely town – and the people here have been just as lovely! I love your spirit and your eagerness to share beauty that passersby may take for granted. Keep up the good work! Thanks! It seems that blessing are everywhere, if we allow ourselves to see them.